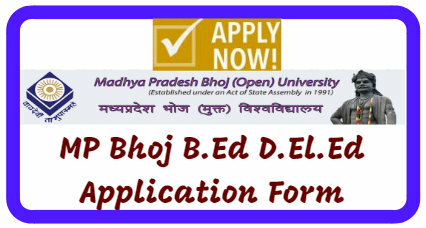 The Madhya Pradesh Bhoj (Open) University (MPBOU) after release the application form is inviting to all eligible candidates for admission into Bachelor of Education and Diploma in Education (B.Ed. / D.Ed.) Course for the Academic Year 2019 through the official website of the Open university portal. Those students desires to take their admission in MP Bhoj BED (ODL) and D.EL.ED (ODL) 2019 then they have to crack the entrance examination for the BED and D.EL.ED courses. The Madhya Pradesh Bhoj (Open) University (MPBOU) candidates aiming to seek admission into B.Ed. / D.Ed. Course with the duration of 02 – 05 Years) are encouraged to proceed with Online Registration. The candidates may apply for the Online application form will be soon update through the official website of the Open University or through the MP online website. Online application form for BED and DED Course 2019 will be submitted through the MP online website. In case of Engineering or Equivalent with 55%. Madhya Pradesh Bhoj Open University shall intimate the Entrance Test shortlisted Candidates through Post / SMS. However, the Status shall be available on the MPBOU Website for the candidates. B.Ed. (Two Years ODL 1st Years) D.Ed. The University will release the BED & D.EL.ED 2019 admit card before the examination through the official website as stated hereunder. All the students may download their exam admit card within 7 days before appearing in the entrance test by entering application number and date of birth etc details. The MP Bhoj Open university will proclaim the BED and D.El.ED 2019 Entrance test results and merit list after finishing the examination at the quickest possible through the official website of the department and also through the MP Online portal. They will upload the entrance exam results within in a month from the test at the website hereby mentioned. Those students will be shortlisted in the merit list of passed candidates they will sit it on the Mp Online BED and D.EL.ED 2019 Entrance Test counseling schedule rounds. I am government teacher in Rajasthan.My qualification B.S.T.C.and B.A.43.11%M.A. I want open Bed .please admissaion your university. Dear Balram Meena, Yes you may apply for the B.Ed through Mp Bhoj but from general category because other state’s candidates can apply with general category only. Hello Ashok, We will inform you soon the MP Bhoj Admission opening date at this web page. Dear Dipti, When D.El.Ed for release on the website then we will notify you. Dear Nathu, Yes you can do B.Ed from MP Bhoj. Sir mene 12 or graduation ignou se kiya he .or mere %gradution me 59.1 he kya me b.ed ya de.el ed kar sakti hu bhoj se. Me gen . Se belong karti hu . Sir can I do del ed.from nIOS or bhoj when I did 12 and graduation from ignou. Dear Seema Dubey, You can do D.El.Ed 2019-20 from either NIOS or MP Bhoj. For more reference please stay tuned with us. hello sir’ MUJE D.ED KRNA H BHOJ SE OR ME YH JANNA CHAHTA HU KI D.ED Ki ENTARCE EXAM KE LIYE TEACHING EXP. CHAHIYE TO KYA USKA FAYDA COUSSLING ME MILEGA …YADI KOI GRADUATION PASS HO TO USKA ….OR GERENAL KI LAST CUTOFF PREVIOUS YEAR KI D.ED KI plz…. Dear Suraiya, Kindly Check the detailed information from the website of MP Bhoj. Stay tuned with us for further updates. I wanna do b.Ed please send me details of entrance exam form. Dear Dolly Jethani, Our team will notify about the notification in respect of MP Bhoj BED 2017 admission Entrance Test 2017 exam form, exam date, syllabus, results etc details at this web portal. So keep stay with us at this page. Dear Jyoti, hereby we will inform you time to time regarding the MP Bhoj Open University BED 2017 Entrance exam details. So you may visit here.